DUG Insight User ManualFrequently Asked QuestionsFrequently Asked Questions KingdomHow do I import a Kingdom polygon to use in Insight? Kingdom polygons are not stored in the Kingdom database and thus will not appear in the Manage Remote Resources window when using the Kingdom Reader. 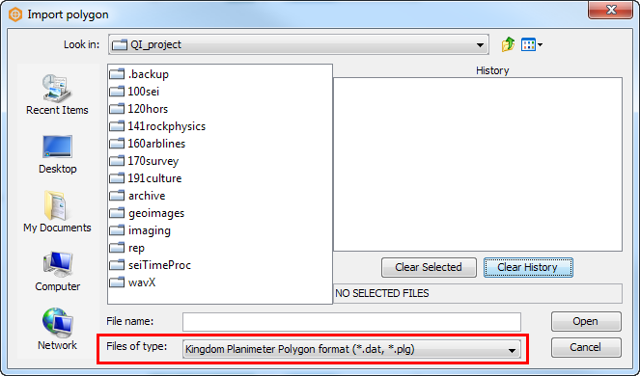 To import a Kingdom polygon, open the Import menu in the Control Panel, select Polygons and change the file type to the Kingdom Planimeter Polygon format (.plg). From the Control Panel, click on the Import menu and select Polygons. In the Import Polygon window, change the Files of type to Kingdom Planimeter Polygon format (*.dat, *.plg). Browse to the polygon that was exported from Kingdom and click Open. Prev: Why does my Kingdom survey appear with a different spacing in Insight?